As you know I always like to offer a meat and vegetarian option whenever possible as I don’t eat meat but I don’t expect my family to follow suit. It is very easy to satisfy everyone with a little bit of planning. Yes it might take a little extra time or an extra pot or two but generally I think I keep everyone satisfied and happy. As primarily a vegetarian I really have to watch my iron intake as mine is a little low and it is easy to overlook it. Iron is found in food in two forms, heme and non-heme iron. Heme iron, which makes up 40 percent of the iron in meat, poultry, and fish, is well absorbed. Non-heme iron, 60 percent of the iron in animal tissue and all the iron in plants (fruits, vegetables, grains, nuts) is less well absorbed. With this being said if one chooses to not eat meat a lot more effort needs to be taken to help suppliment this.The richest sources of heme iron in the diet include lean meat and seafood. Dietary sources of nonheme iron include nuts, beans, vegetables, and fortified grain products. In order to get my fill of iron in this meal I included the tofu. 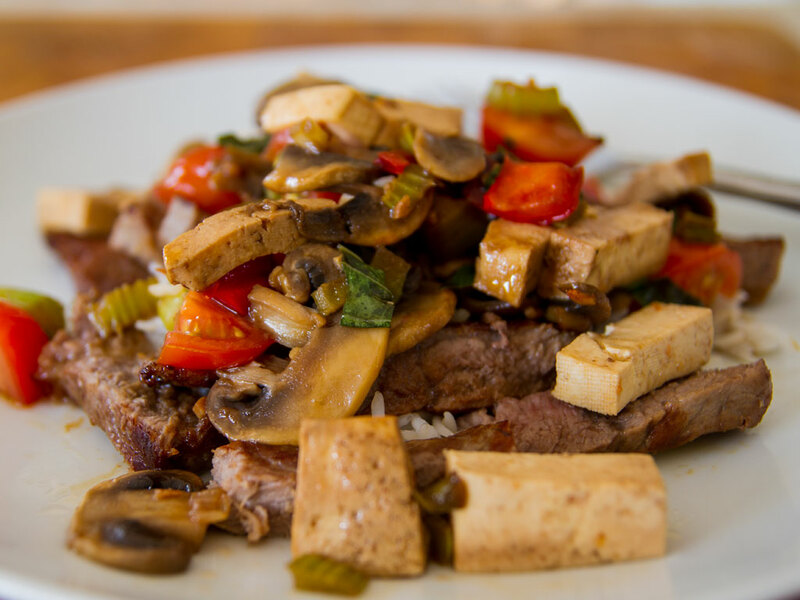 For a 100g of tofu there are 5.4mg of iron. 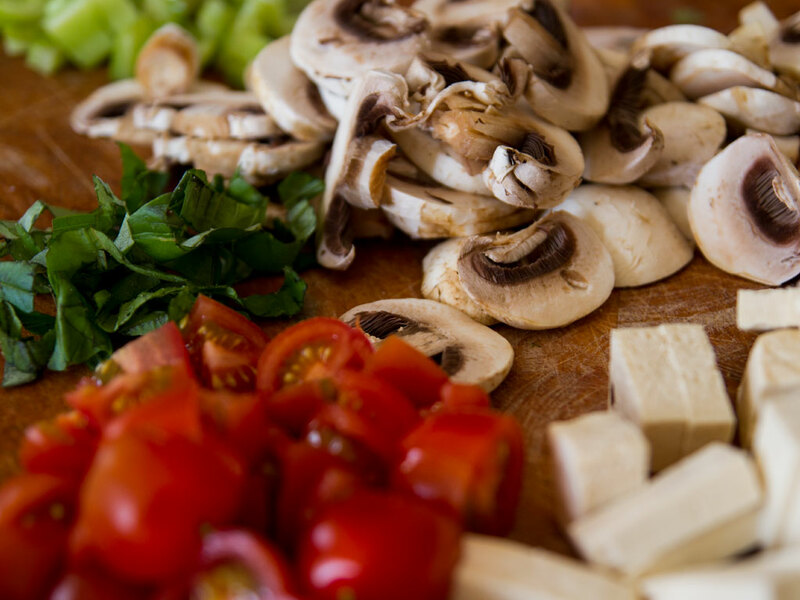 Some studies suggest that tofu can prevent breast cancer, according to FitDay.com. But remember, if you do replace your meat with tofu, you would have to eat more to meet the daily recommended levels of protein. Heat oil in a deep pan and saute the onion and garlic till soft. In a separate frying pan fry steaks but do not over cook. Slice steak into thin strips fry for a few minutes more then remove from heat and set a side. Add the peppers and tofu to the fried onions and fry for 3 minutes. Add the celery and continue to fry. Add mushrooms and sweet basil and cook till mushrooms have turned light brown. Add soy sauce and tomatoes and fry till heated through. At this point you can keep the stir fry vegetarian and serve the beef to those who desire the meat. Other wise turn steak strips into the stir fry and mix well. Serve piping hot over hot Basmati rice.